Called Out formed and began actually singing out in 2000. David and Don Bledsole, being sons of a minister, have roots dating back as far as they can remember of standing in the pulpit of churches singing. Through these five short years, there have been changes made. Different peoples have come and gone for various reasons but the Lord has never failed them. God has fulfilled and supplied every need on a constant and continual basis for the group. David and his brother, Don feel truly blessed to have been supplied with members that love the Lord and are willing to give their time and talent to further God's kingdom. 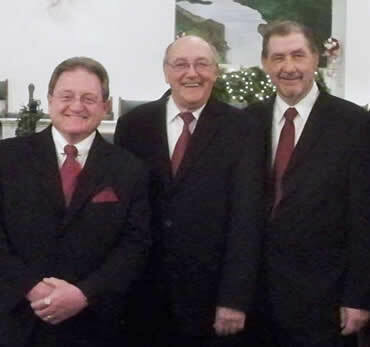 The members of the group are Darrell Austin, tenor singer from Thomasville, NC; David and Don Bledsole, lead and baritone for the group. They are also the founders and owner of Called Out Ministries and both reside in Brown Summit, NC. The members of the group all stand together in the agreement and belief that God put them together and is going to complete the work in each one of them that He began. We believe that the Holy Bible is the inspired word of God (2 Timothy 3:16 & John 1:1) and there is only one true church (3 Corinthians 12:12-13 & Act 2:14). We believe that Jesus is the son of God who was born of a virgin and lived on the earth until he went to the cross where he was put to death by way of crucifixion and was resurrected and he now sits at the right hand of the Father in heaven. We believe that through the death of Jesus our sin was taken away and we receive the righteousness of God (2 Corinthians 5:21) And that salvation can only be found through Jesus Christ our Lord (John 14:6). Our mission is to uplift the name of Jesus through song and word to all. We seek to be lead by the Holy Spirit in all things. We pray that lost souls might be drawn through the convicting power of the Holy Spirit that they will be saved and thus adding to the Kingdom of God by way of salvation and to keep the unity of the spirit endeavoring in the bond of peace through Jesus Christ our Lord.